On Tuesday, January 23rd at 4:30 pm in Science Center 101, the community forum “Swarthmore’s Role in Global Decarbonization” will be open to all interested attendees. According to Nicholas DiMaio ’19, the organizer of the event, the purpose of this forum is to “improve Swarthmore student, faculty, and staff commitment and capacity to strategically advance climate work on campus.” DiMaio and fellow members of the Swarthmore chapter of “Put A Price On It” encourage students to appear at this forum in order to learn more about climate change, carbon pricing, and the Swarthmore Carbon Charge, as well as to share their views on the climate actions being taken by the College. Swarthmore’s Carbon Charge imposes a fee on campus departments to pay for the costs of our carbon dioxide emissions, which is calculated by multiplying the College’s greenhouse gas emissions with the social cost of carbon. Funding is then used for carbon reduction and education and engagement initiatives. The United Nations Framework Convention on Climate Change (UNFCCC) stated its intended limit to global temperature rise below 2.0℃, ideally below 1.5℃, in its draft of the 2016 Paris Climate Accord, also known as the Paris Agreement. Climate scientists project high improbability that the world will limit warming below 1.5℃, however, and warn of the difficulty of keeping it below 2.0℃. Climate models show that current emission reductions commitments put forth by member nations of the United Nations put us at about 3.0℃ of warming. Should we exceed the warming limits set by the UNFCCC, scientists predict extreme weather patterns, sea level rise, transformations of the biosphere, and socio-political volatility, among many possible changes. Effects will not be uniform across the globe – some regions may benefit from the warming, while other nations and their ecosystems will be particularly vulnerable. For more information on the science and impacts of climate change, I recommend visiting NASA’s webpage on “Global Climate Change: Vital Signs of the Planet”. In June of 2017, The United States rescinded its formerly stated participation in the Paris Agreement. Though full departure from the agreement requires a legal process that takes about four years to finalize, this withdrawal signifies that the Trump administration will not pursue the greenhouse gas reductions that were previously promised under the Paris Agreement, sparking ire among some fellow committed nations and environmentalists. The ambitious limit of 1.5℃ falls even farther out of reach as the United States regresses on climate change mitigation without other nations picking up the slack. Talk of possible reconsideration by President Trump has been reduced to rumors, and renegotiations of the agreement (requested by Trump) appear to be a pipe dream. Despite federal disengagement from climate efforts, businesses, local governments, states, and institutions of higher education have stated their allegiance to the Paris Agreement and to reductions in carbon dioxide emissions – Swarthmore College included. Reducing carbon emissions gets at the root source of the cause of climate change. In order to prevent 2.0℃ of warming, we need to understand exactly how much carbon dioxide should be reduced, and this can be quantified and represented by the carbon bubble. If we were to extract and combust all known fossil fuel reserves, including coal, oil, and natural gas, this would amount to 2,795 billion tons of carbon dioxide. However, to keep warming below 2.0℃, we must limit emissions to 565 billion tons of carbon dioxide from this day forward until 2050. In an economy that currently fails to account for the social costs of carbon emissions and a lack of private investment in renewable energy, we must creatively limit its demand and/or supply through innovative policies that can correct for these market failures. Two policies that have been proposed to align the social and private costs of carbon are cap-and-trade and a direct carbon tax. Carbon taxes put a price on emissions by levying a tax on fossil fuels based on the emissions associated with burning them. This system predetermines what fee will be paid to the government per metric ton of carbon released, but does not guarantee a specific emissions reduction trajectory. Cap-and-trade is a converse model to a carbon tax, whereby the emissions reduction target is predetermined, while the price on carbon emissions is not. Thus far, efforts towards a national carbon tax have ended in failure, but state programs have been attempted, and some implemented. One such attempt was Initiative 732 – a tax proposal on carbon emissions formed in Washington state. Initiative 732 is a revenue neutral carbon tax, which means that it increase government revenue and therefore does not alter the size of the government. In 2005, the states of New York, New Hampshire, Rhode Island, Delaware, Massachusetts, Maine, and Maryland established a cap-and-trade system through the Regional Greenhouse Gas Initiative (RGGI), the first cap-and-trade program in North America. California implemented its own cap-and-trade system in 2012. Swarthmore’s carbon charge consists of four main components: 1) a 1.25% tax on departments’ operations budgets, 2) a shadow price, 3) a Green Revolving Fund established by former President’s Sustainability Research Fellow Aaron Metheney ’18 in coordination with the Carbon Charge Committee and Ecosphere Executive Committee, and 4) political endorsement. The shadow price requires that cost-benefit analyses for capital projects include the lifecycle and social costs of carbon emissions, as well as financial considerations. The Green Revolving Fund finances energy efficiency projects in the form of a loan, which is reimbursed with the savings generated through the energy saving projects. President Val Smith placed her own endorsement by signing onto the “Put a Price on It” campaign, which encourages elected officials to enact carbon pricing on a statewide and national scale. The “Put A Price On It” campaign promotes charging carbon as the optimal means to addressing climate change. 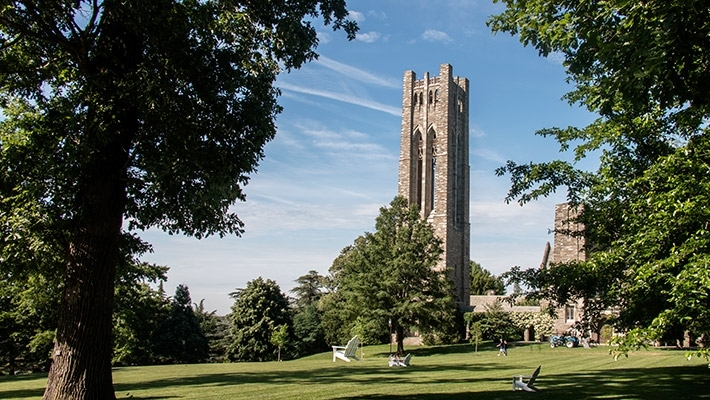 Swarthmore College pledged its support of the campaign during Spring 2017. Members of the Swarthmore chapter of “Put A Price On It” believe that Swarthmore College holds great potential for educating and engaging others on carbon pricing, and as being an epicenter for a larger political push. As the different spheres of our nation respond to climate change, we are called to question Swarthmore’s role. What actions can the college take? What actions should we take? If we are to make commitments, what are the steps required and who is to participate in seeing them through? These questions will be explored at the “Swarthmore’s Role in Global Decarbonization” forum. A diversity of opinions will be voiced by panelists Greg Brown, Vice President for Finance & Administration, Calla Bush St. George ’20 from Serenity Soular, Carr Everbach, Professor of Engineering and Environmental Studies, Nathan Graf ’16, Climate Action Senior Fellow in the Office of Sustainability, Ralph Thayer, Director of Maintenance, and a student from Sunrise Swarthmore. Your perspective and thoughts are also encouraged to be shared in this discourse. The forum is expected to last for 90 minutes, composed of a 5-minute introductory statement, 55 minutes of prepared panel responses, a 20-minute group conversation, 5 minutes on how audience members can plug into work, and 5 minutes for audience reflections. If you are interested in other ways to learn about carbon pricing, tune in to the carbon pricing newsletter and stop by a meeting of the Swarthmore chapter of “Put A Price On It.” We hope that you will share your insight and perspective on this issue of planetary proportions. I am currently working with a group of students at Middlebury College on this very same campaign. We’re encouraging the College to put an internal price on its own carbon emissions and to support the very active Vermont campaign to put a price on carbon. We are also asking the president of Middlebury College to sign the letter supporting a national carbon price. We are very aware of what Swarthmore is doing in this regard and hope to have good news to share about our campaign by the end of this academic year. Thanks for leading the charge. California is trending toward eliminating the sale of gasoline fueled vehicles in the near future which may reduce the need for gasoline in the State, but the unintended consequences of banning gasoline fueled cars is that manufactured aviation, gasoline and diesel fuels from crude oil are the economic reasons refineries exist, but our lifestyle is dependent on the “other” stuff that we get out of crude oil. California transportation fuels for commercial and military aviation are 10,000,000 gallons per day, and gasoline and diesel are 50,000,000 gallons per day for the 35 million registered vehicles of which 97% are NOT EV’s. Fuels are about 50% of the products manufactured from crude oil, thus, the refineries live to produce fuels, NOT to just manufacture all the other wonderful products that come from petroleum. There needs to be a “financial” need for refineries to continue to operate to produce JUST the other chemicals and by-products. Thus, what financial impact could there be to California if one or more of the in-state refineries shutdown, and the need arises to import all those fuels on a daily basis to support the 6th largest economy in the world? Yes! Why even bother with the paid deniers and front groups who thrive creating the delay of a false climate debate? A revenue neutral carbon fee with a dividend, makes enormous sense (cents, too)! ! Economists and scientists say it is the best way to create healthy and safe communities. It is not a tax. This way citizens would RECEIVE the carbon fees as a monthly check, for example. That would protect us from price spikes in dirty energy. It would more rapidly limit further pollution than by regulations alone, as happened in BC Canada with a similar, popular policy. BC lowered emissions and also lowered taxes with their fees. limit the problem of climate trauma is worth it. For example: the cost of sea level rise ALONE is so great that no effort to prevent it is unwarranted.